While I am a Ron Paul supporter, I do have my concerns about the the candidate- namely, his age. 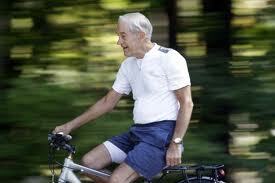 If elected, he would be 77 years old by the time he assumes office in January 2013. That is seven years older than Reagan was when he became the oldest man to ever take the white house. I fear that 77 is just too old to represent a country now greatly dominated by a youth who have found a distinct voice in the political system. Think back to the last presidential election when America rejected the 71-year-old McCain, who got lots of flack for his age. But Paul honestly puts my worries to rest when he says, “It’s the ideas that count. It’s your general health that counts. It’s your enthusiasm for liberty. I endorse young ideas.” After all, his ideas are very young and he seems fit as a fiddle. If he is able to represent the ideas of a young generation, maybe his age doesn’t matter. And American culture has started to reject the very notion of aging; fifty is the new 35. As you get older, you get better. Paul is surging in the polls, consistently in second in Iowa behind Gingrich. It looks like he has a real chance at the white house. Does Paul’s age matter? I’m curious to hear your thoughts. Ron Paul is animated and passionate when he debate. He seems to have more energy than ANY of the other candidates! He has singlehandedly changed the terms of the debate, in a very positive way.